The community-based not-for-profit sector in Toronto, which includes community service organizations, social enterprises, or cultural organizations that have open mandates and provide a public good in the broader community, helps advance the social and cultural vitality of the city. Economically, the sector generates over $14 billion in annual revenues and employs hundreds of thousands of residents. A 2018-2020 work plan with a focus on economic development of the sector/not-for-profit owned real estate and improve administrative processes so to make it easier for community partners to work with the City. Proclamation of Toronto’s inaugural Not-for-Profit Recognition Day, by the Mayor in 2019. Progress reports to City Council every two years, beginning in 2019. Around the world, there is growing interest in exploring how governments and the not-for-profit sector can work together better. In Canada, the Federal Government and nine out of ten provinces have launched strategic agreements with the sector in the last decade. The community-based not-for-profit sector in Toronto is well-established, enjoys a high degree of legitimacy and advances the social and cultural vitality of the city. The sector is also a major economic force in Toronto, generating over $14 billion in annual revenues and creating jobs for hundreds of thousands of residents. Given the significance of Toronto’s not-for-profit sector and the value and complexity of the City’s investments in the sector, City Council adopted a policy framework called For Public Benefit: City of Toronto Framework for Working with Not-for-Profits. Demonstrate the core values of care and service to others in their work. The City invests about $1.2 billion in the not-for-profit sector annually through transfers from the tax-base, flow-through provincial and federal transfers, fee/tax deductions, loan guarantees and other supports. The City brings a whole-of-government lens to financial arrangements with the sector because of the scale of the relationship. A 2018-2020 priority is to review financial tools involving not-for-profits to reduce the administrative burden for the City and Sector and increase transparency. 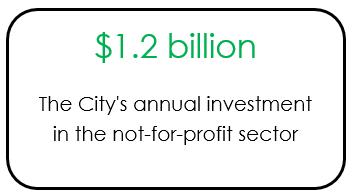 The City has a mandate to support economic and workforce development in several private sector industries but has not extended similar support to not-for-profits. A 2018-2020 priority is to identify ways to support the economic impact and sustainability of not-for-profits in Toronto. The framework for working with not-for-profits includes six core commitments, shown below. Progress against the first work plan will be reported to City Council by Q2 2019. The City commits to recognizing and regularly reporting on the role and contributions of the not-for-profit sector in achieving shared strategic goals. The City commits to continuous collaboration and dialogue with the not-for-profit sector to identify shared priorities, opportunities and mutual approaches for enhancing the public good. The City commits to promoting the financial sustainability, innovation and economic impact of the public benefit sector. The City commits to further leveraging the community engagement capacities of the public benefit sector so that resident involvement in strategic City issues becomes more inclusive and effective. The City commits to identifying opportunities to improve and where appropriate to harmonize financial administration processes involving the Not for Profit Sector. The City commits to working to advance decent work goals and effective governance in the not-for-profit sector.